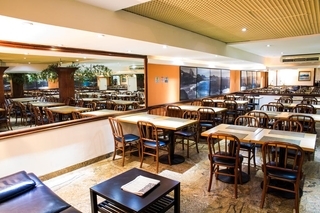 Arena Ipanema Hotel is situated in Rio de Janeiro, just 100 m from the famous Ipanema Beach. The hotel has an outdoor pool and sun terrace, and guests can enjoy a meal at the restaurant or a drink at the bar.Each room has a flat-screen TV with cable channels. Some rooms have a seating area for guests convenience. Certain units feature views of the sea or city. All rooms are equipped with a private bathroom fitted with a shower. For customer's comfort, free toiletries are offered, and a hair dryer is available. Free WiFi is available throughout the property.At Arena Ipanema Hotel, guests can relax at the sauna or exercise at the on-site fitness centre. Other facilities include a 24-hour front desk and bike hire.Copacabana Beach is 500 m from Arena Ipanema Hotel, while Sugarloaf Mountain is 8 km away. 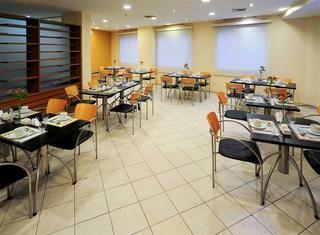 The nearest airport is Santos Dumont Airport, 9 km from Arena Ipanema Hotel. The Mercure Rio de Janeiro Arpoador hotel is located by the famous Ipanema beach, 7.5 miles (12 km) from Santos Dumont Airport. 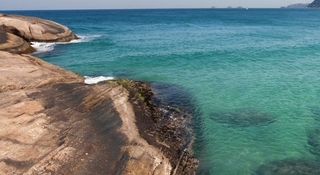 It is located in a strategic area, with access to the main tourist attractions in Rio de Janeiro. The comfortable rooms boast modern decor, air conditioning and WIFI. The hotel also features a leisure area complete with pool, fitness center and sauna. What's more, some apartments offer incredible views of the Girl from Ipanema Park and the ocean. Enjoying a vibrant setting in Rio de Janeiro, this hotel is perfectly situated between the neighbourhoods of Copacabana, Arpoador and Ipanema. The hotel boasts a spectacular setting close to the centre of this lively city, and is located within easy access of the most intriguing entertainment areas in Rio de Janeiro. Guests will be impressed by the host of attractions the city has to offer, all of which are within easy reach of the hotel. Just a short walking distance away lie the spectacular beaches for which the area is renowned. Boasting some of the world's most beautiful beaches, the area is the perfect choice for travellers who are seeking a truly unique seaside break. The beautifully-appointed guest rooms are tastefully decorated and come complete with a range of modern amenities for visitors' convenience and comfort. Boosting a perfect location in the Rio de Janeiro, with stunning view to the Sugar loaf Mountain, and being only a two minutes’ walk far from Copacana Beach and Ipanema Beach, hotel provides the unique opportunity to enjoy the most remarkable sunset in the city. Indulge yourself in the marvelous landscape kissed by the calm blue waves of the sea and the emerald presence of the mountains surrounding it, being at peace amazed in this city characterized by surprising skyscrapers.Guests will find the restaurant at your disposal, and the business guests may take advantage of the three conference rooms offered by hotel with various capacities.Rooms are beautifully decorated in tranquil tones, are offering the clients the possibility of harmonically rest during their holidays. They provide all the necessary facilities to make you stay: TV, minibar, bathroom, hairdryer,telephone and a dining table. 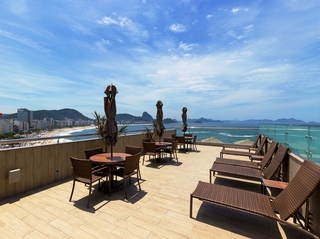 The Mercure Rio de Janeiro Ipanema is less than 500 m from Ipanema and Copacabana beaches. Walk for 8 minutes to see the statue of Carlos Drummond or in the opposite direction for the statue of Tom Jobim. To enjoy a beautiful view of Rio de Janeiro, walk for 10min to Pedra do Arpoador. 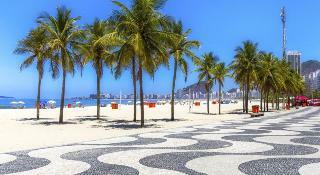 Visit also the centenary Forte de Copacabana, one of the most visited Carioca sights, 14min from the hotel. Orla Copacabana Hotel is an impressive hotel looking out on Copacabana Beach in Rio de Janeiro offering great facilities and services. On the premises you'll find a swimming pool, a restaurant, a sauna, and a gym, as well as a number of bars. Complete with well-equipped guestrooms and a charming terrace with fantastic views, this property is a convenient choice for your next visit to Rio de Janeiro. The beaches of Copacabana and Ipanema and the Corcovado, the Sugarloaf – iconic images of Brazil, are within easy reach from this modern hotel in Rio de Janeiro. The beaches and a large variety of restaurants and shops are just a few steps away, attractions such as the Culture Palace, Candelaria Church, St. Anthony Monastery, Fine Arts Museum or the Museum of Modern Art are easily reachable. The international airport is only 23 km away. The hotel is located in a privileged area, next to the beach of Copacabana, which is one of the most famous beaches in the world. It is the ideal place to stay whether for pleasure or business, offering comfortable spaces, tranquillity and premium services. Thanks to its privileged location and infrastructure, this city residence provides easy access to all parts of the wonderful city of Rio de Janeiro. 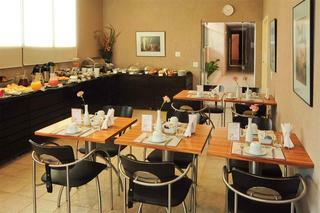 Comprising a total of 88 guestrooms, the air-conditioned establishment features useful facilities and a helpful staff. The hotel offers rooms equipped with a variety of amenities such as a telephone, cable TV, Internet access and individually regulated air conditioning for maximum comfort. The en-suite bathrooms are fitted with a shower and a hairdryer. It is the first time that fashion and the hotel business have joined in Brazil to create an environment of interior design and styling concept. The Best Western Premier Arpoador Fashion Hotel by Gloria Coelho presents inspirations from the stylist, with whites, light streams, wood, glass and vertical gardens, bringing a technological and minimalist tone to the hotel. The apartments are full of facilities, with exclusive amenities and the mini bar with some items is included in the daily rate, following the new local philosophy that incorporates well-being with regional products. Experience a unique service in Rio de Janeiro, such as the pillow menu, with four options of different heights and materials, inside the apartment and, to encourage sports practice, you can borrow a bike to ride the Ipanema bike path. In addition, the cuisine, in Maia's Restaurant, is specializes in contemporary international cuisine.